This week Lukashenka lost one of his most important allies. Georgian leader Mikheil Saakashvili lost parliamentary elections and is going to switch to opposition. Belarusian ruler expressed his admiration for Saakashvili which was willing to give up the power. Saakashvili has been an important channel for Belarusian government to communicate with the West. Of course, Lukashenka is known for his ideas of integration with Russia while Saakashvili is a symbol of pro-Western policy in the former Soviet Union. At the first glance any relations between them look improbable. Their alliance, however, makes perfect sense and tells a lot about Belarusian regime and intricacies of post-Soviet international relations. After the collapse of the Soviet Union Georgia opted for distancing from post-Soviet integration. For years it has been paralysed by civil strife and separatist conflicts. Belarus in those years maintained goo relations only with Armenia from the whole region. Such line corresponded to the general pro-Russian foreign policy of Belarus at that time. There was not much what Tbilisi could offer Belarus then. Initially, the Georgian officials after revolution undertook to promote democracy in fellow post-Soviet Belarus. Georgian parliament discussed the legislative prohibition on Lukashenka's entry to Georgia, Saakashvili wrote articles for International Herald Tribune about liberation of Belarus. Belarusian authorities detained Georgian citizens for alleged helping Belarusian opposition and intimidated the people at the 2006 elections with tales about Georgian terrorists going to destabilise situation in the country. This situation changed in 2007. It was personal decision of Lukashenka who against advice of his foreign ministry decided to actively develop relations between Belarus and Georgia. Very probably that mediating role to bring two leaders together played a moderately anti-Russian leader of the Ukrain's Orange revolution Viktor Yushchenko. He had surprisingly good relations with the Belarusian ruler and is godfather of the second son of the Georgian leader. Yushchenko was probably also involved in rapprochement of Belarus with Azerbaijan confronting pro-Russian Armenia. In June 2007, Tbilisi opened its embassy in Minsk. After Russian war against Georgia in summer 2008 Belarusian leadership verbally supported Russia yet effectively helped Georgia. In particular Minsk despite numerous promises did not recognise two break-away regions of Georgia and recommended Belarusians enter separatist regions only through areas controlled by Georgian central government. Moreover, Belarus did not support Russian-initiated economic blockade of Georgia which was in place since 2006. Lukashenka maintained visa-free regime for Georgian nationals. Belarus actually provided them with an easy channel to visit Russia (which requires visas from Georgians) even at the most tense times in Russian-Georgian relationship. In 2009, Georgian leadership explicitly changed their position on democracy problems in Belarus, explaining that Belarus “suffers from Russian aggression.” Georgian foreign ministry urged Western nation to abolish sanctions against Belarus. When the European Union launched the Eastern Partnership, Georgia supported Minsk in the 2010 dispute over who should represent Belarus in its parliamentary forum. Belarus wanted to send the members of its unrecognised parliament to the forum, while the EU invited only the opposition and civil society organisations. Tbilisi did not give up its Belarusian ally even after Lukashenka fell out with the West because of the 2010 elections. In April this year, Georgia welcomed release of the leader of radical Belarusian opposition Andrei Sannikau and his colleague Zmicier Bandarenka. Moreover, Tbilisi expressed hope that it would facilitate the renewal of direct dialogue between Belarus and the EU, as well as ensure full-fledged inclusion of the country into Eastern Partnership initiative. Lukashenka appreciated this help. According to his recent statement: “We are grateful and I said that publicly both to Mikheil Saakashvili and all Georgian politicians which supported us at international forums – in Eastern Partnership, the UN, before Americans and Europeans. Saakashvili at all has been a defender of Belarusian policy, and that is true”. Belarusian regime is clearly not staunchly anti-Western. It tries to survive, and to that end it avoids becoming a besieged fortress. In this context relations with Georgian leadership – pro-Western and well connected in the West – play a very big part. Georgian leader was a good communicator, interpreter and messenger of Lukashenka to the West. 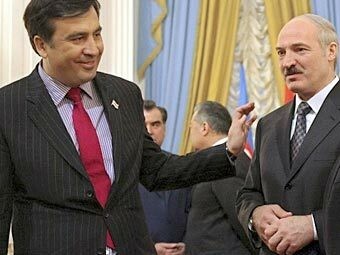 Lukashenka also had similar relations with Ilham Alieyev of Azerbaijan. Azerbaijan helped Belarus to implement potentially dangerous to Russian interests oil swap with Venezuela and borrowed money when Moscow put pressure on Minsk. Belarus is not only an Eastern European but also a post-Soviet state. Nations which emancipated from former Russian empire still have a lot of common problems and interests. Among them is the sensitive issue of finding a balance between strengthening national independence and building democracy. No wonder that Yushchenko and Saakashvili known as democratic revolutionaries in the West find themselves next to the "Europe's last dictator".